The accessories that we use for beading are often the last thing you’d expect to find in a craft room or workspace. Sometimes, the right tool for the job was intended for something completely different. Fishing tackle boxes of all shapes and sizes are perfect for storage and beading on the go. Serving trays lined with fabric make great bead boards. Nail files are just the right size for buffing the burrs off beads. Last month, I shared a little glimpse of some Bracelet a Week beads on my absolute favorite beading accessory - a plastic veggies and dip server. One of my wonderful readers requested a closer look, so I thought I’d show you exactly how awesome this unusual beading helper is. The tray is a durable and portable version of serving trays that have been around forever. Visit any thrift store or garage sale, and you’re likely to find at least one vintage serving tray with cute little compartments for separating hors d’oeuvres and treats. 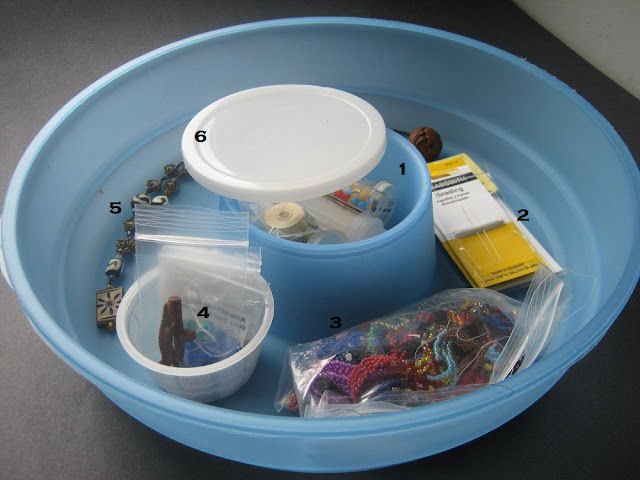 The open style trays are awesome for sorting big lots of mixed beads, or separating different components for a complex project. Inside my container is a small central compartment. It’s meant for dip, and has it’s own lid to keep condiments fresh and free of debris during transport. This is another one of my favorite features. Over the years, this middle compartment has seen a steady rotation of different supplies. The outer ring is big enough for almost everything I need for beading. The only thing it doesn’t hold is large spools of Fireline, but I like to keep those within arms reach at all times. 1. Right now I use the ‘secret’ compartment to hold tubes of stick pins, sewing needles, and bobbins of Nymo. There’s also a little vial of clasps that I saved back when I used to take apart costume jewelry for the unique beads. Since I don’t use these things often, but I don’t want them stuffed into the back of my beading cupboard, I store them in this little cubby for somewhat easy access. 2. Blister packs of English beading needles fit perfectly in the outer ring. If there are a lot of works in progress taking up room, they can even be stacked on their sides to save space. 3. This baggie that I saved from a bead order is always stuffed full of UFOs and miscellaneous beading scraps. I never feel like taking apart unsuccessful projects. 4. There’s usually a cup of floater beads - pieces I want to keep handy for future use. Sometimes I’ll put new finds in here to remind myself that I want to use them sooner rather than later. It also helps me not to forget what I originally intended and use them for something else. 5. Most of the time, there’s space in the tray left over to store finished pieces before photographing them. It’s a safe and convenient place to put designs out of the way until I can get them in front of the camera. 6. This mini lid is almost always on, but once in awhile it actually helps with a project or sorting job. What I love most about this portable tray is the enormous, round lid. Turned upside down, it makes an excellent beading board, with room enough for all of my supplies and beads. When I need to put a project away fast, all I have to do is lay the beadwork on the tray and put it up on the top of my roll top desk, so it’s out of reach and unlikely to spill. The rim on the underside is just the right size for holding 6mm beads, and has been helpful many times for planning projects with accent beads in a specific pattern. The circular shape comes in really handy when I’m working with a lot of different beads in a sequence. I can place cups of beads around the outer edge, and rotate the tray like a lazy susan to move on to the next color or shape. This is exactly what I did for my Easter Egg bracelet, which used 11 different beads - one style at a time. 1. Another ‘found object’ beading tool I love is the plastic cups from single serving apple sauce. I saved and washed so many of them from kids lunches that they take up a huge space in my cupboard. They’re great for mixing paints, sorting beads, and all kinds of little storage jobs. This particular cup is where I toss all of my culled beads. 2. I usually have a few different cups on my tray filled with empty bead baggies, reserve quantities of the beads I’m working with, and sometimes beads from previous projects that I haven’t put away yet. I also keep a few empty cups around for mixing and sorting, or to funnel beads from coasters, back into their baggies and tubes. 3. This stack of coffee coasters never leaves the tray. They are wonderful for bead weaving, because I can pick up beads one-handed. They’re so shallow that they’re practically flat. 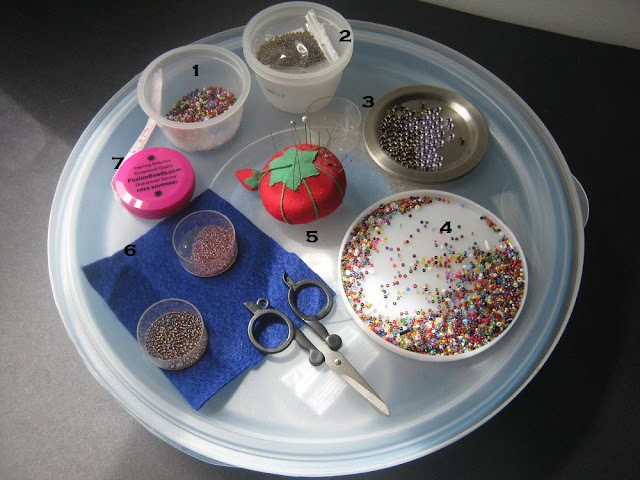 If I’m working on a project that switches frequently between bead sizes or colors, I will usually spill a small amount of each onto one or two of these mini trays. 4. The lid from the inner compartment also doubles as an extra large shallow bead cup, which is great for sorting beads or working with mixes. 5. My trusty pin cushion has seen a lot of beading. It always holds two size 10 needles, one size 13 needle, and an assortment of stick pins and small sewing needles that come in handy now and then. There is also one black and one white seed bead pinned to it. These used to be go-anywhere stop beads, but when I started selling my creations, I switched to using a new stop bead - from the culled bead cup - for each length of thread. This makes it easy to count threads used at the end of a project. 6. I find my cups and coasters work really well for setting out beads, but it would be easy enough to glue a piece of fabric to the tray for a handy bead mat. Atop this swatch is a pair of my favorite bead cups - old tealight holders - and my trusty scissors. I grabbed them out of a miniature sewing kit and they are sharp as razors. 7. I have a paper ruler taped to my work surface for easy measuring, but sometimes a flexible ruler is needed. I don’t always have space for my tape measure on the tray, but it often rests here between projects. So there you have it. The most awesome all in one beading accessory - for me. What’s your favorite tool or storage accessory? Wow! Who knew one container could do all that! Great ideas! I have something I love on my beading table. From Pier 1 I've purchased a few of those flatish small dishes you use for dipping sushi in. The are really pretty and I can put stray beads, needles, stuff I want to save for now in them and they still look adorable! That looks like just the job! I'm pretty new to beading, currently all my supplies are in a basket which fits into a storage unit next to the sofa. When I'm beading, I put my beading mat on the pouff and have stuff scattered around me! I really need a system! Thank you so much for this! It's so helpful to see how other people get organized to do the beading. You do have a great system here! I may have to make a trip to the Salvation Army store to try to find one of those containers! Thanks again, Mortira! You are most welcome, Sally! I had a lot of fun putting this together, so thank you for your question! I have to admit that I picked my tray up at a dollar store, but I highly recommend checking out thrift stores first. If they won't be used for food, used is a great way to get plastic accessories. Great, glad I am not only one, washing and reusing plastic (and glass) containers. I had some washed, still on my kitchen cabinet. My husband passed away Sunday and my mom felt the need to clean off my cabinet ... She threw them away! I said I had a use for those, she just rolled her eyes. One of my fav Dollar store items is trays to use in your kitchen drawer for utensils. (Long and small width) PERFECT for keeping the small bags in order. Different tray for Lucite, Metal colored acrylic, glass flowers, differnt colors of findings. I love the idea of the veggies and dip server. I'm always looking for bits and pieces around the house to keep my beads sorted in some kind of order. Since I'm doing a lot of bead weaving with size 11 and 15 seed beads, I can't live without my beading mat. I have a wide, flat container (for sandwiches I think) in which I leave my mat with all my beads laid out on it, and with another mat on top they tend to stay put. I can fit plenty of tubes of beads, and other bits of pieces in there as well. Thanks, Rose - I would love that! Be sure to send me a link so I can check it out when you're finished. This is such a wonderfully helpful post. Really enjoyed it. Thanks for some great organizing tips! Thanks, Rose! I loved the article. It's always interesting to get a look at another artist's creative spaces.